This is the first of two posts based on Bruce McVean’s The New City lecture given on Monday 11th February 2013 at Cambridge University Department of Architecture. You can read Part 2 here. Cities have always been shaped by transport; and the planning and design of cities has always impacted on transport choices. Rising car ownership after the Second World War freed developers from the need to build homes within walking distance of public transport, shops and services; and at the same time, lobbying by car manufacturers, government investment in road building, and changes in planning policy and development economics helped make the car the primary mode of transport. The negative impacts of rising car ownership and use have long been acknowledged. In 1960 the UK’s Ministry of Transport commissioned a team led by Colin Buchanan to look at the problem, resulting in the publication of Traffic in Towns in 1963. 50 years later the project steering group’s famous acknowledgement that, “We are nourishing at immense cost a monster of great destructiveness. And yet we love him dearly…” still rings true. Many people continue to aspire to car ownership, or view owning a car as essential to maintaining a high quality of life. And who are we to deny them when electric cars will soon wean us off carbon dioxide emitting toxic fossil fuels? 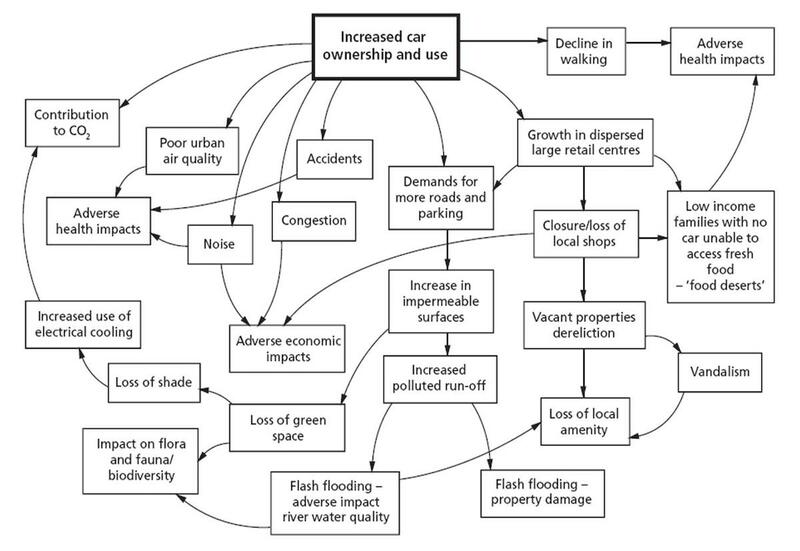 Cleaner engines may reduce the contribution that car travel makes to carbon emissions and air pollution, but they won’t solve the myriad other negative impacts of car dependency that are neatly summarised in the diagram below from the Royal Commission on Environmental Pollution’s report The Urban Environment (click the following graphics to view full size). Tackling carbon emissions and air pollution is an essential task, but it’s not the only task – the big villain isn’t the internal combustion engine, it’s the car. One of the major issues that I feel gets too little debate is the inherent unfairness built into a car dominated transport system. 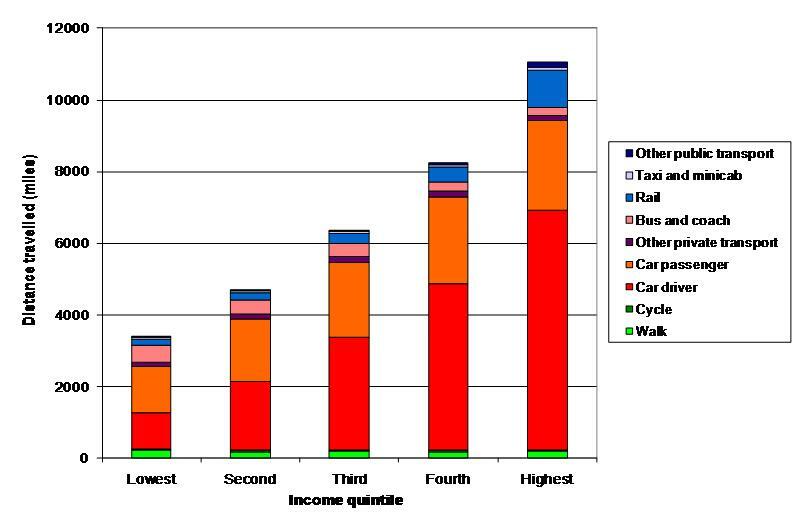 The chart below, taken from Sustainable Development Commission’s excellent report Fairness in a Car-Dependent Society, clearly highlights that those that are better off travel the most. As the report notes, the widespread availability and affordability of car travel has brought many benefits, but these have been obtained at a substantial price. A price that falls most heavily on the poorest and most vulnerable – the ones that travel, and therefore benefit, the least. 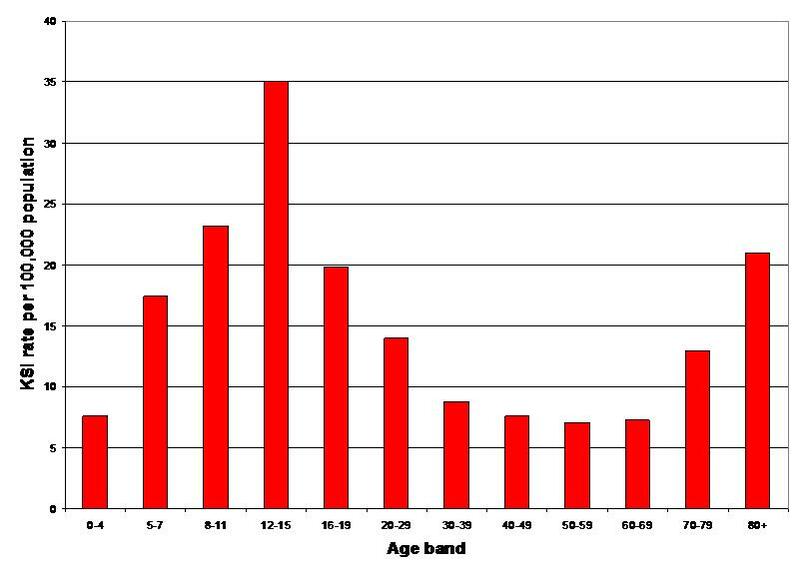 Similarly, it is those too young or old to drive that are most likely to be killed or seriously injured on our roads (see chart below, again taken from Fairness in a Car-Dependent Society). To borrow a phrase from RoadPeace’s Director, Amy Aeron-Thomas, “We may share the road, but we don’t share the risk.” Risk is unacceptably skewed towards pedestrians and cyclists. Responsibility for minimising risk must by extension fall on those who have the potential to do most harm – motorists. Even when driven slowly cars dominate our streets and impose themselves on other users. Add speed to the equation and they own the street completely. As a result many people are discouraged from walking and would never contemplate cycling. Statistically walking and cycling may be low risk activities – and the health benefits certainly far outweigh the risks – but no amount of statistics can change the often unpleasant and at times frightening experience of trying to negotiate a street network that has been engineered around the needs of the motorist. Given this situation it’s little surprise that the majority of people are failing to meet the minimum recommended amount of physical activity required to maintain a healthy weight – at least 30 minutes of moderate intensity activity five times a week. In responding to the obesity epidemic policy too often focuses on reducing calorie intake, while neglecting the potential benefits of creating a built environment that makes it easy and attractive for people to incorporate physical activity into travel. Yet only by doing this will it be possible to get the whole population active, something that can’t be achieved by exhorting people to join the gym and hoping that Olympic success in 2012 will inspire mass take up of organised sport. Car dependency can also limit our social lives, as Appleyard and Lintell discovered in 1972 when they studied the correlation between the traffic volume on a street and the relationships between neighbours on that street. The result was perhaps unsurprising; those streets with the heaviest traffic were also the ones where least people interacted with their neighbours. Cities exist to allow people to socialise – people love to be around and to watch other people – how then can we make sure that our streets are places where people want to spend their time and that our cities are great places to live, work and play? I’ll explore some of the answers to that question in Part 2. Bruce McVean is Integrated Design Manager at Beyond Green and Founder of Movement for Liveable London. I recently reviewed (I’m a urban planner) an low-income apartment building that is built to promote defensible space and reduce “loitering and crime” by placing individual entrances on the back of the building and reducing social interactions. I hear it works, but at what cost? I can’t say I’ve ever read anything about this…although I have books on my shelve waiting to be read!